The standard for daily consumption of fruits and vegetables is 5 servings. Each serving comes to 80 to 100 grams depending on the age and body weight of the individual. If you are an average American in your teens, you should be getting five 100 gram servings of fruits and vegetables throughout the day. 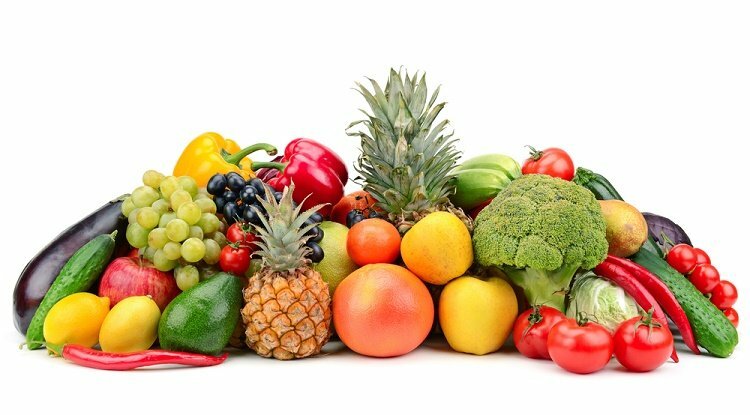 Following 8 easy ways to eat more fruits and vegetables daily will help you remain fit, light and happy. It might sound difficult, especially if you have always had bread and meat during all your meals or have always snacked on processed foods. But if you want to break the habit of eating saturated fats and food high in sugars and sodium, this is the way to go. The struggle is temporary and short-lived. Within a week, you will get used to the idea of eating more fruits and vegetables as part of your three main meals. It will also make the transition from processed snacks to snacking on fruits and nuts easier. The freshness and lightness you will experience after such a meal will be great. Most importantly, you will not have a lingering hunger nor will you crave sugary treats. Eating fresh fruit has more benefits since it also adds fiber, but one glass of unsweetened fruit juice is also fine. You can also make fruit or vegetable smoothies for breakfast. Juicing is a popular and healthy way of reducing body fat as it keeps you full longer and curbs cravings. You can also try fruit infused waters during summers to keep hydrated and also to get vitamins and minerals from the fruits. Again, if you are used to snacking on bars of chocolate or a bag of potato chips, it might seem hard to gobble up a couple of celery sticks or a couple of baby carrots. But when you think about it, it is much easier. Both celery and baby carrots are crunchy, they are easy to carry, and also super easy to eat. And you can get your favorite low-fat dip along. When you are at home, you can add iceberg lettuce and small fruits like berries for your 4 PM snack. We never tire of fried chicken. But eating it every day only aids deterioration of health and causes many complications like acne, oily skin, digestive disorders and obesity. Employ healthy methods to cook your chicken or change your diet plan to include fish and other non-fatty meats. Eating food steamed in herbs and dressed in simple olive oil and lemon juice opens up new and easy ways to eat more fruits and vegetables daily. Greens and leafy greens are great sources of folic acid, vitamins and some minerals. You can wilt a handful of greens and season them with salt and pepper and serve them on the side along with you rice or pasta. Cooking vegetables only reduces the nutritive values by a small percentage. It is better to eat cooked vegetables than none at all. Make thick creamy (without adding dairy cream of course) soups with carrots, butternut squash, and pumpkin and add tiny bits of chopped vegetables to the chicken broth and meat broth while making traditional soups. Thick soups are filling and loaded with vegetables and keep you full but light. Add grapes, orange wedges, berries and nuts to salads and bakes for more easy ways to eat more fruits and vegetables daily. They not only give a fruity punch to the dishes but also are great replacements for salt, sugar and many savory processed ingredients when combined with herbs like rosemary, thyme and basil. Ideally, it is 5 meals a day: 3 square ones and 2 snacks. But owing to our lifestyle and skewed diet, we tend to crave more sugars and salt. Frequently snacking on small quantities of toasted nuts, boiled eggs, crunchy vegetables with hummus and other tasty yet healthy dips will help reduce such cravings over time. It also adds to easy ways to eat more fruits and vegetables daily. Human body takes no holidays. So, the notion to splurge and starve is fundamentally incorrect. There is no prejudice against an occasional indulgence, like a birthday cake or an anniversary roast or a thanksgiving feast. But modern lifestyles and raised standard of living has brought every manner of indulgence to our doorstep- that too – on a daily basis. While we rave about exotic foods and pills that correct our body weight, we fail to see the easy ways to eat more fruits and vegetables daily that are really enough to stay fit and healthy along with a bit of exercise.